The provision of water for municipal consumption is an example of a watershed service, a class of ecosystem services. In most municipal water systems, these services are not paid for by the city or by the individual water users. The water users pay for the engineered system that gathers, stores, treats, and delivers the water, but not for the watershed services that produce drinking water of sufficient quality and quantity to support community residents. Valuing the watershed services associated with water provision and charging water users for these services allows water authorities to generate revenue to restore and protect municipal watersheds. From the perspective of the public lands manager, revenues from payments for ecosystem services can provide funding for managing the public lands and the associated natural resources. 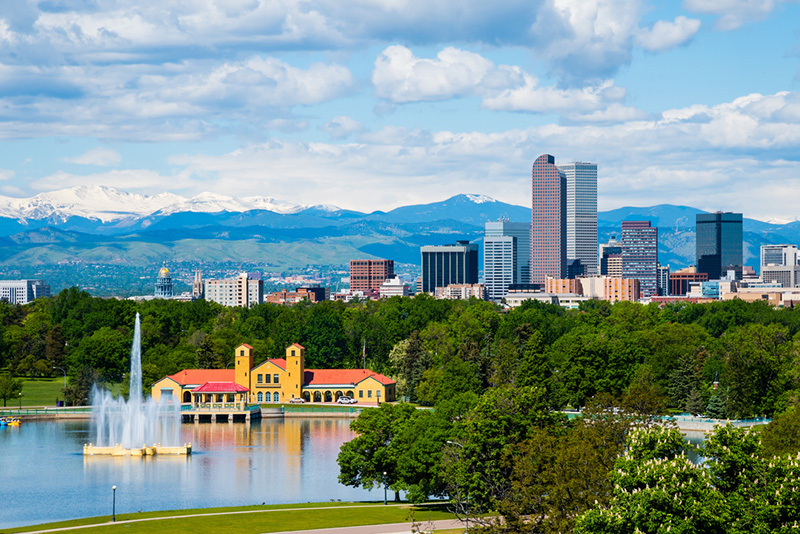 View of downtown Denver, Colorado as seen from City Park. A changing climate and increased risk of catastrophic wildfire in the upper reaches of some of the more important watersheds in the West, particularly those that serve millions of people in large metropolitan communities, has greatly increased attention to watershed services in recent years. Commonly, there is a large increase in sedimentation in reservoirs after severe wildfires; this decreases water quality, reduces the quantity of water, and causes significant increases in water filtration costs. To reduce the risk of wildfire in municipal watersheds and to maintain water quality and quantity for municipal water systems, landscape-scale forest restoration projects in the watershed are essential to returning the forest to a healthy condition. A catastrophic wildfire in a watershed creates significant costs for taxpayers, both locally and nationally, due to fire management and suppression, shutdowns and repairs of water supply infrastructure, reservoir dredging, and vegetation restoration. A catastrophic (7,000 acre or more) wildfire can cost taxpayers an estimated total of $20-$30 million per fire event. Forest restoration activities can reduce or eliminate the risk of a catastrophic wildfire, and include prescribed burns, mechanical thinning, creation of firebreaks, removal of non-native tree species, water releases to mimic spring flooding, and monitoring of new treatments for adaptive management. The cost for these vegetation management strategies over a 20-year period is estimated at $4.3 million, or an average of $200,000 per year. This is considerably less expensive than the estimated $20 or $30 million cost associated with a severe wildfire. The cost savings associated with proactive forest restoration and watershed protection therefore can be a significant incentive to utilities, municipalities, and water providers to pursue PWS structures that pay landowners and land managers to restore the landscape in upper watershed regions. In the case of Denver Water, a confluence of events precipitated the utility pursuing a PWS program in recent years. A changing climate bringing milder winters and a persistent pine bark beetle infestation into Colorado’s high country, where many watershed headwaters are located, combined with some of the most severe long-term, drought-driven fire seasons to hit the state in decades. Over the past couple of decades, a series of catastrophic forest fires – most notably, the Hayman Fire in 2002, and the 12,000-acre Buffalo Creek Fire prior to that – occurred in the upper watershed reaches of the rivers that supply the City of Denver’s 1.4 million residents with drinking water. The heavy rains that followed the fires washed a significant amount of debris and sediment into the watershed, compromising the reservoir system for Denver Water and impacting water quality and safety. The impact to upstream reservoirs critical to Denver Water’s provision of services to area residents cost the utility over $40 million dollars in treatment, sediment dredging and removal, and projects to address the water quality issues created by the wildfires and their aftermath. In 2010, Denver Water and the US Forest Service (USFS) entered into a PWS agreement by which Denver Water would provide $16.5 million in matching funding – totaling $33 million overall – to support the USFS in overseeing a variety of forest restoration and wildfire management activities in the upper watersheds, such as restoration, thinning, fuel reduction projects, and other efforts to lower the risk of catastrophic wildfire in areas critical to Denver Water’s supplies. This has been noted as one of the largest PWS programs in the West, securing funds to treat over 38,000 forested acres over a five-year period. River systems included in this program are the Upper South Platte River, the headwaters to the South Platte River, the St. Vrain River, the Colorado River headwaters, and the Blue River watershed. Denver Water has raised the funds to provide its share of the match through a small surcharge added to customers’ water bills. The utility estimates that it will only cost each household a total of $27 over the five-year period to fund the program and reduce future water treatment costs.